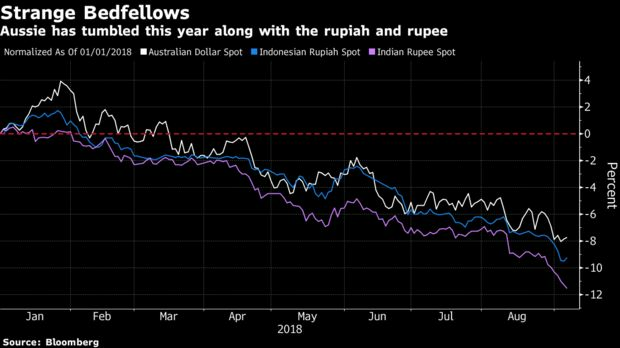 Australia’s dollar is finding itself in unusual company these days, getting sold along with former emerging-market darlings such as the Indonesian rupiah and Indian rupee. As a rout grips developing markets, the Aussie -- viewed as a barometer for global risk appetite -- is also bearing the brunt of investor angst. While nobody’s expecting the currency to be swept up in full-fledged contagion, it’s being battered due to the economy’s close ties to China and reliance on offshore funding. “There is a growing consensus around China tariff/trade concerns building, and broader EM weakness persisting,’’ said Andrew Canobi, director of fixed income for Australia at Franklin Templeton Investments in Melbourne. So far we’ve stopped short of predicting the Aussie will drop below 70 U.S. cents, but downside risks are building, he said. The Aussie’s fall from grace -- it was trading at parity to the U.S. dollar as recently as 2013 -- is the flip side of previous gains that were fueled by years of record Chinese demand for its commodities. Australia’s currency is also suffering along with emerging-market assets as global funds withdraw in favor of returning to the greenback. The Aussie has slumped 3.6 percent in the past month. That exceeds the rupiah’s 3.1 percent drop, while the rupee has tumbled more than 4 percent. Still, the drivers of the recent losses differ to some extent. While emerging-market currencies have been pummeled by contagion fears from the financial turmoil in Turkey and Argentina, Australia’s dollar has been dented by the impact of tighter global liquidity on its banks. Three-month funding costs have risen almost 8 percent this year, and three major Australian banks have pushed up mortgage rates, spurring concern this will damp economic growth and make it even less likely the Reserve Bank of Australia will raise interest rates. The next risk factor for the Aussie will come from a possible escalation of the U.S.-China trade war. With the public comment period for new American tariffs on Chinese goods ending on Thursday, the expectation is that U.S. President Donald Trump will impose additional duties soon. China buys more than a third of Australia’s exports -- equivalent to about 8 percent of the South Pacific nation’s gross domestic product. The dependence helped drive the correlation between the Aussie and the offshore yuan to the strongest on record last month. The Aussie will probably extend losses to 70.60 U.S. cents soon, said Wong, a treasury strategist at CIMB Bank Bhd. in Singapore. The currency fell to as low as 71.38 cents on Friday, the weakest since March 2016.